My favourite part of the festival-embroidery . 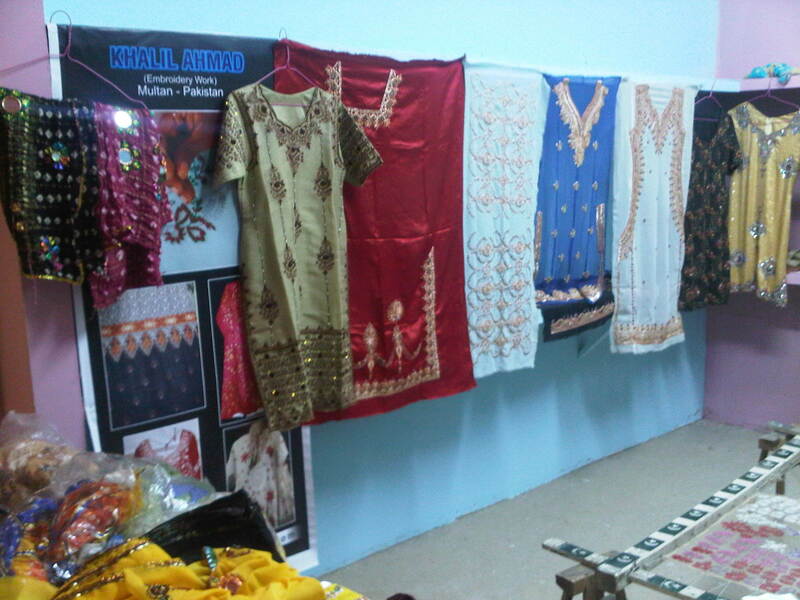 The embroidery displayed was from Pakisthan. For the first time I saw zardosi motifs –which can be attached to anything. Only a few pieces were there,but all were exquisite . Some embroidered unstitched tunics were also on display.And a workcot for making zardosi motifs is also seen here. Women from the Middle east have been commisioning their grand wedding dresses from Pakisthan. 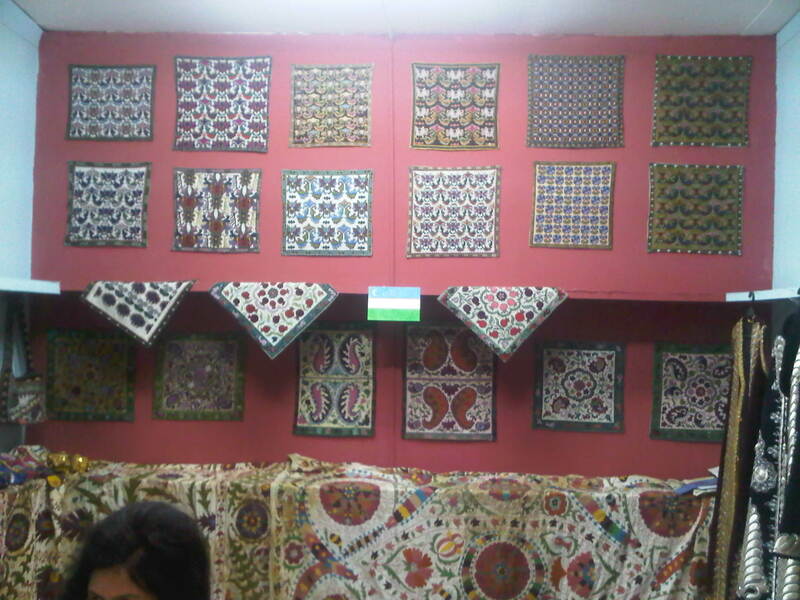 The Pakisthani embroidery is very famous. With this my posts on Muscat festival is over. 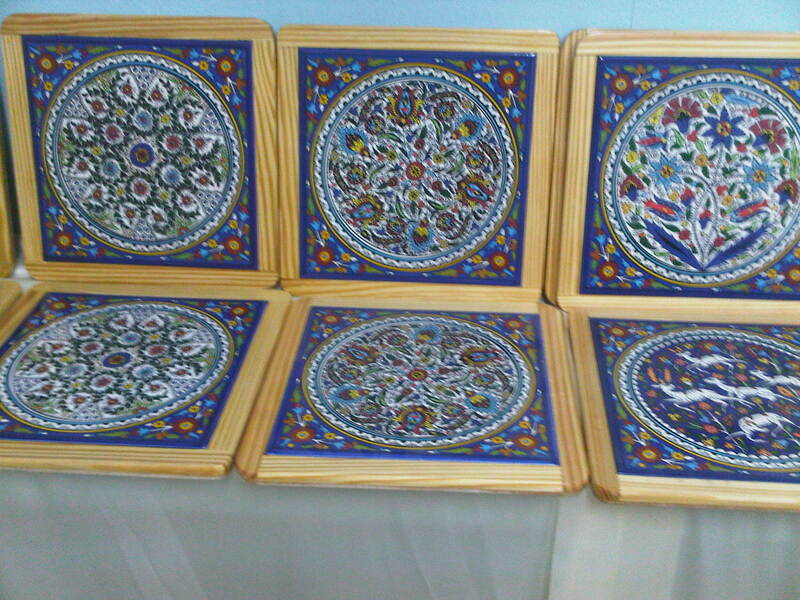 Iam happy to share the information about handicraft items from all over the world, which were part of the festival. By writing about them, I was able to go through the experience all over again. 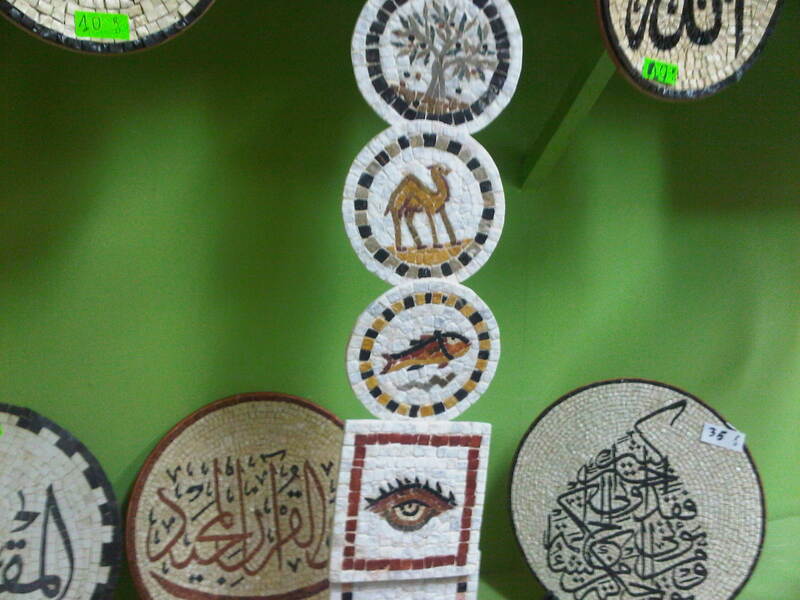 In this section,we saw lamp shades made from camel skin. 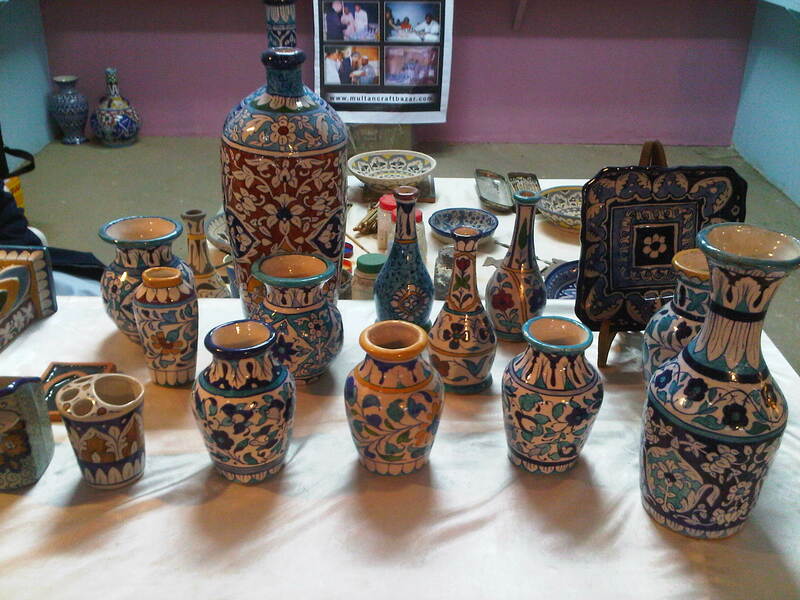 This craft is from Pakisthan. The artists have specialized in this art , and have been doing it for generations.there were pictures of works in progress.The pieces are painted in different shapes and lamp are fitted inside each piece. We enjoyed looking at these beautiful lamp shades. 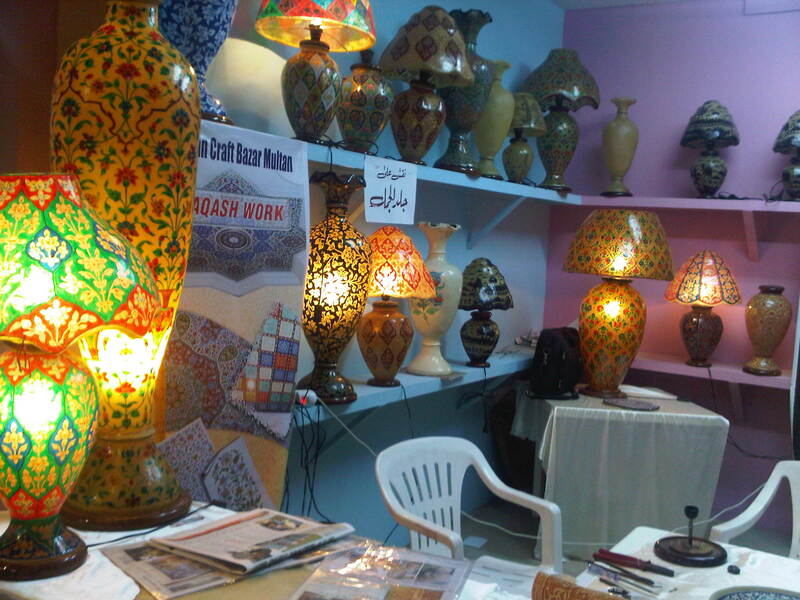 In India also I have seen lamp shades made of animal skin . the patterns used for painting are mythological figures,[inspired by puppetry art of Karnataka-this comes under perfoming arts,there are many families doing it]. Another important feature in this type of art is.- holes are made at uniform intervals, when light passes through the holes , beautiful patterns are formed. Another craft in next post. 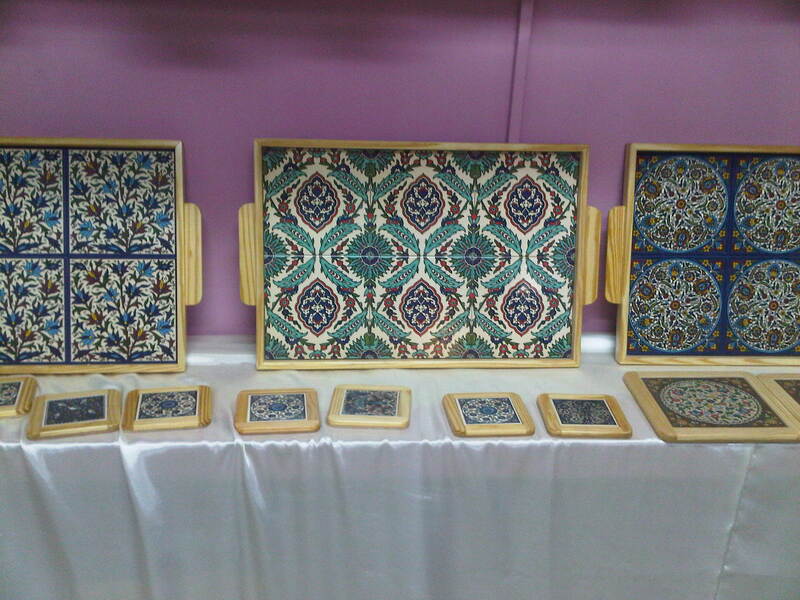 In this there were so many hand painted tiles on display and sale .Dear Hubby was so impressed, kept on clicking! 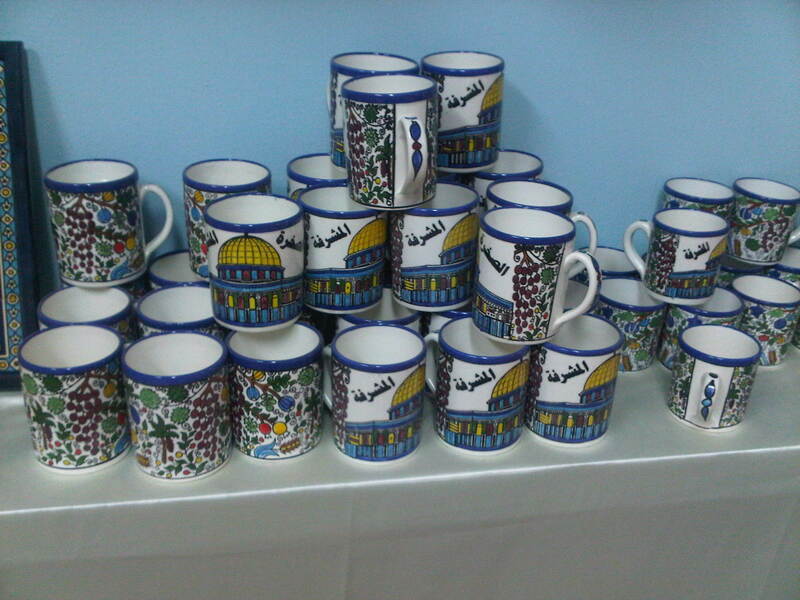 There were painted trays, pictures, cups, vases.These were also from Syria. The patterns were so inspiring for me, I don’t mind having these pictures. If I use the same colour combinations and embroider on a white tunic, will I also look like a tile? We are both heavy- idea considered and postponed for another time! 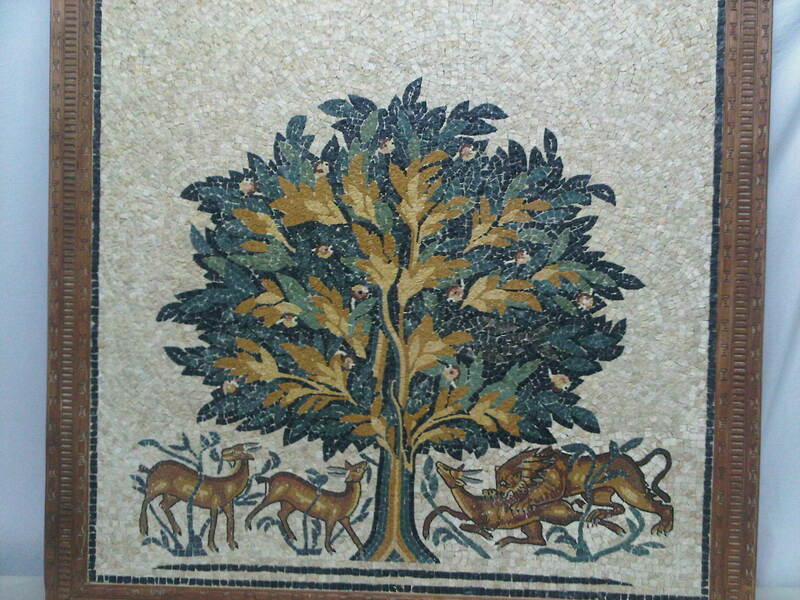 Here the art of mosaic was done with cut stones. We were able to watch the artist doing this on a large floral drawing. Different coloured stones are chosen for the whole picture. The artist chooses the colour for each and every boundry.then according to the space available with utmost concentration, cuts the stone[requiring lots of strength] and positions it to see the effect ,then applies white glue, then sticks the stone there. It was very interesting to watch the whole process. For the first time I was able to see a mosaic being created. 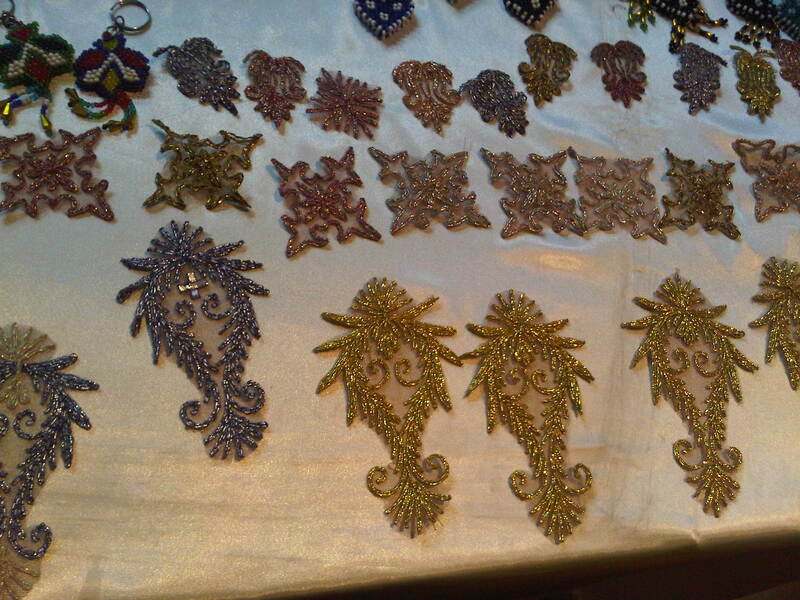 Another stall had accessories made in cross stitch, there were no stitchers ,just these pieces for sale. I remember these were from Syria. 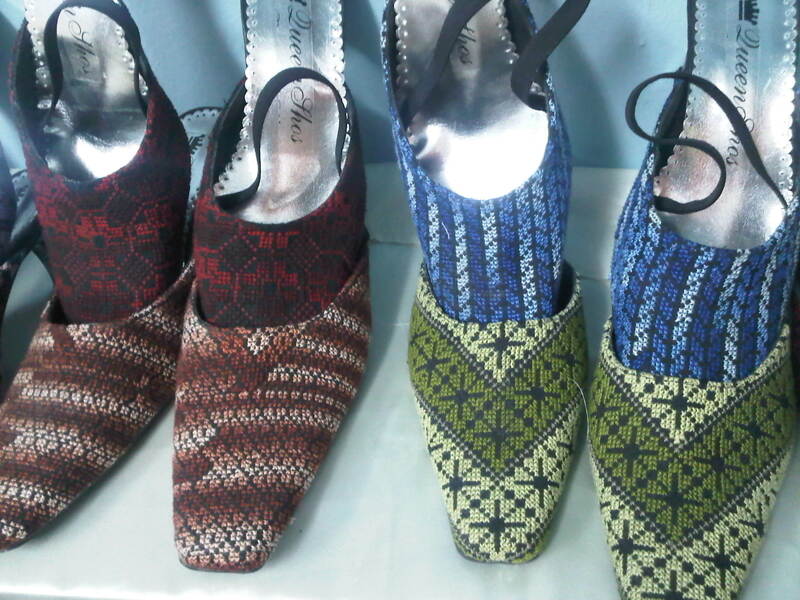 I loved the patterns on these pieces. Though , had seen a few on the internet,this was first time I actually saw these pieces. We get many embroidered accessories from North India, but the work is different,The patterns are big and bold and the embroidery done in primary colours. 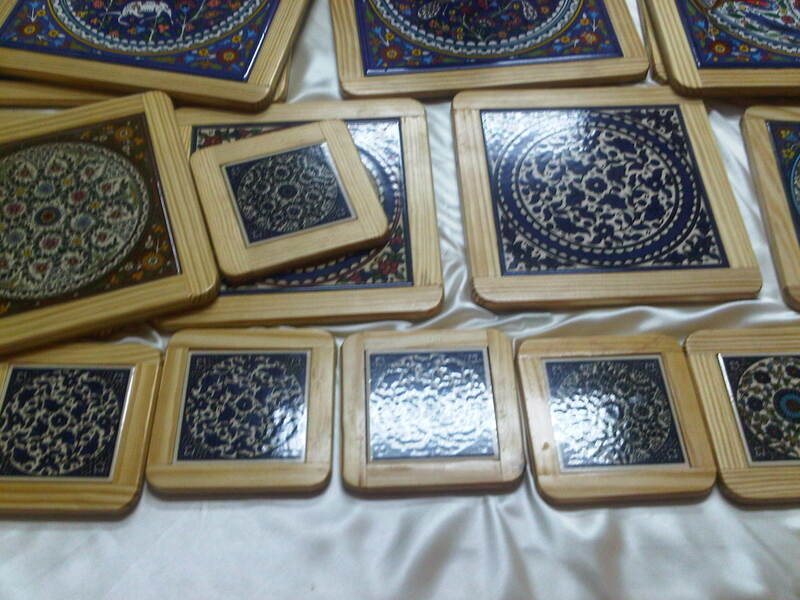 Some good zardosi purses are also available,. 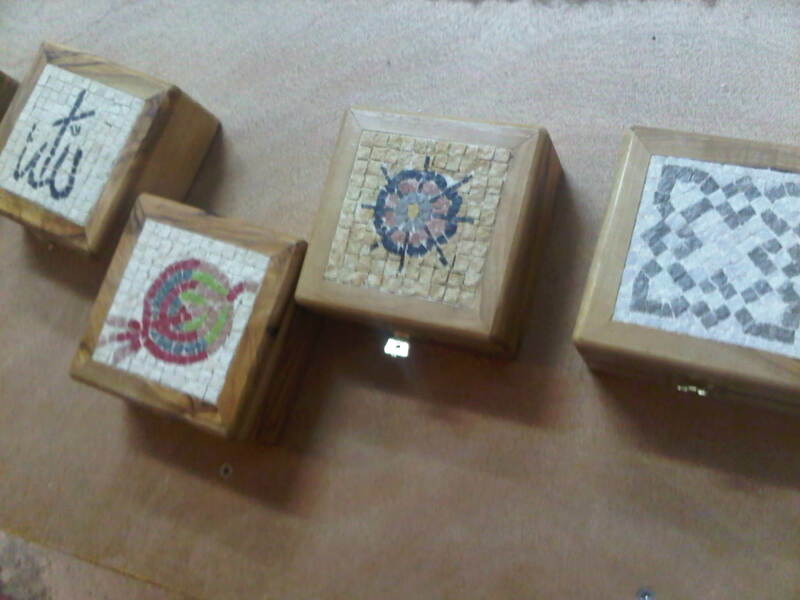 Some more handicrafts are still there. 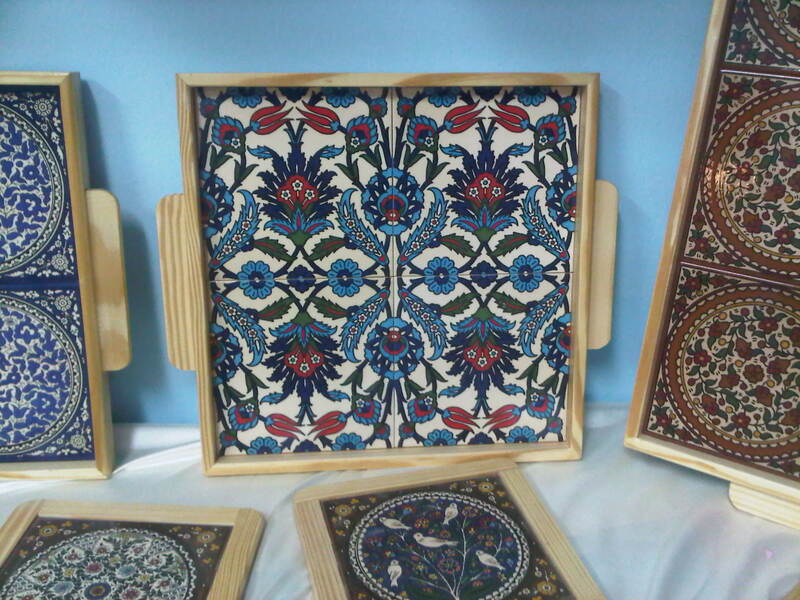 One of the stalls in the Muscat festival had squares pieces made in cross stitch. I had an opportunity to see the artist working on a piece. 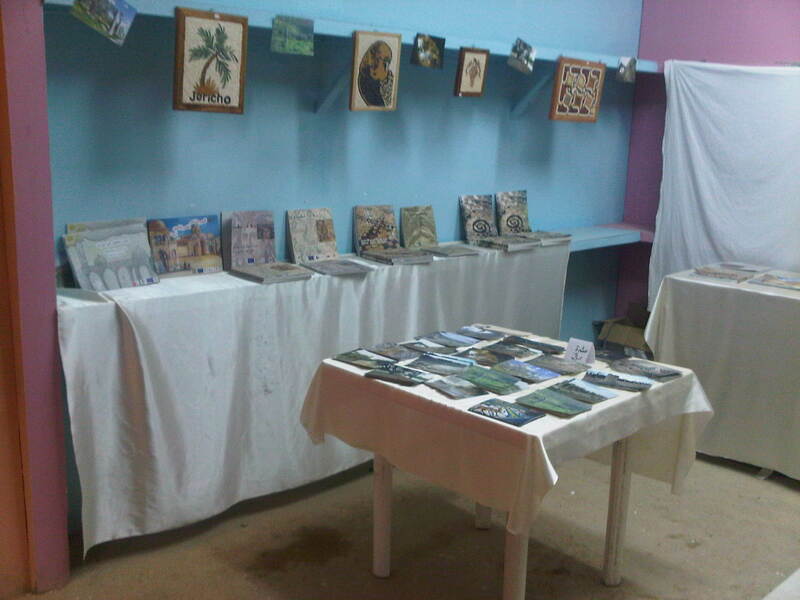 That is another important aspect of this festival, where we can see the artists working with their creations. 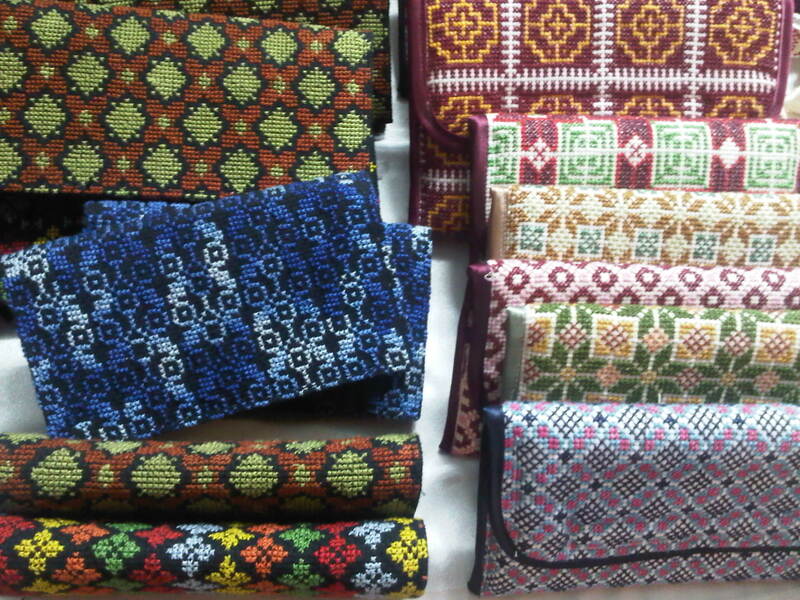 The squares are even weave cloth in light or black colours, the designs are [as far as I could see] were textile patterns or background patterns. 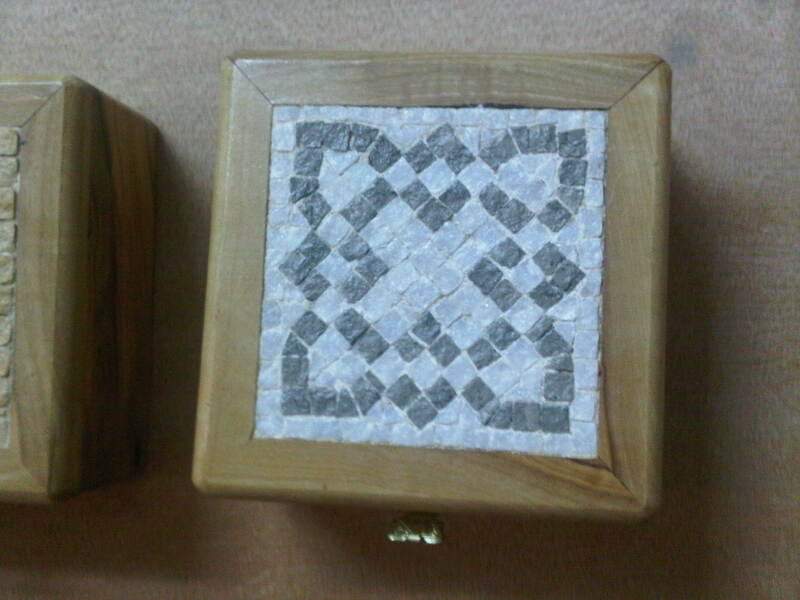 The squares are then stitched as cushions or framed as pictures. The patterns were beautiful and very intricate. It would take a long time to complete on square. I was amazed at the patience of the stitcher. I did not take any close-ups, to respect the stitcher. 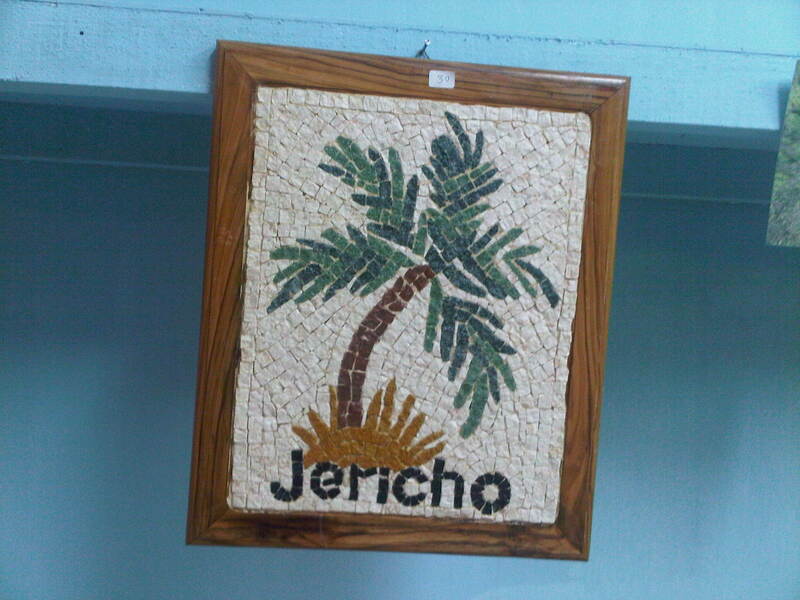 As seen, some large embroidered wall hangings were also on display.